Some workplace injuries are so debilitating that they threaten to shatter your world along with your body. Although all New Jersey employers are required to cover their employees with workers’ compensation insurance, employers and their insurance companies are often unwilling to cooperate with injured employees and provide them with medical attention, until they learn that the employee has an attorney. Workers’ compensation can provide monetary benefits to cover medical bills, including surgery, physical or occupational therapy, and psychiatric treatment for post-traumatic stress; permanent injury (including spinal trauma, disfigurement, joint injuries, amputation, closed-head injuries, psychiatric injuries, dental injuries, loss of sight and loss of hearing); loss of income, loss of future earning capacity; and loss of life. Attorney Larry M. Pollack can find out who the workers compensation insurance company is, contact them and insist that a claim be set up and medical treatment authorized immediately, and can fight to get you your temporary disability payments if you are unable to work. If the compensation carrier is uncooperative, Larry M. Pollack Esq. will not hesitate (as many attorneys do) to file a motion with the workers’ compensation court demanding that the insurer pay medical benefits and/or temporary disability benefits. If the workers’ compensation insurance company or self-insured employer refuses to authorize proper medical care, Larry can often arrange for a doctor to advance you treatment while you wait for the court to review your case. If the compensation carrier is uncooperative, Larry M. Pollack Esq. will file a motion for medical/temporary disability benefits with the New Jersey workers’ compensation court. Whether you work in a construction site or an office, whether you have been exposed to toxic chemicals or have repeatedly stressed your joints in a way that causes permanent, lasting pain, you have rights under New Jersey workers’ compensation laws. 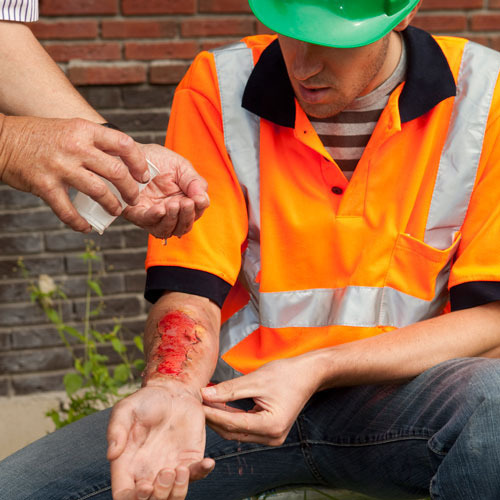 If you have been injured at work it is important to seek medical assistance as soon as possible. Only a medical professional can properly diagnose the extent of your injuries and prescribe the correct treatment. You should not hesitate to call an ambulance or go to the local hospital emergency room immediately. You should also insist that your employer report the injury to its workers’ compensation insurance carrier right away, because apart from going to the ER, you need to obtain all your medical treatment from physicians pre-authorized by the workers’ compensation insurance carrier. You should also contact a New Jersey workers’ compensation attorney for legal help in determining whether you can recover your medical costs and other losses due to your injury suffered at work. The Second Injury Fund was created in 1923 to make benefit payments to totally and permanently disabled workers in cases where the current disability is partially due to a prior injury or condition. In the appropriate case, joining the Second Injury Fund can be a crucial step towards maximizing the injured worker’s recovery. All work-related injury cases call for expert legal representation. To know your rights and receive the care and attention your New Jersey workers comp case deserves, contact Larry M. Pollack, Esq.